Download "TITLE 18 INSURANCE DELAWARE ADMINISTRATIVE CODE"
2 2 TITLE 18 INSURANCE 5.0 Insurance Identification Cards for Personal Lines Coverage 5.1 The Insurance Identification Card for privately owned or leased motor vehicles and/or for vehicles that are used non-commercially but covered under commercial lines policies shall contain the following information, whether the card is provided in written or electronic format: The statement "The ID card must be carried in the vehicle at all times" shall be shown on the face of the card if space is available; otherwise this statement may appear on the back of the card Card shall be identified as "Identification Card." The insurance company name shall be printed on the face of the card. 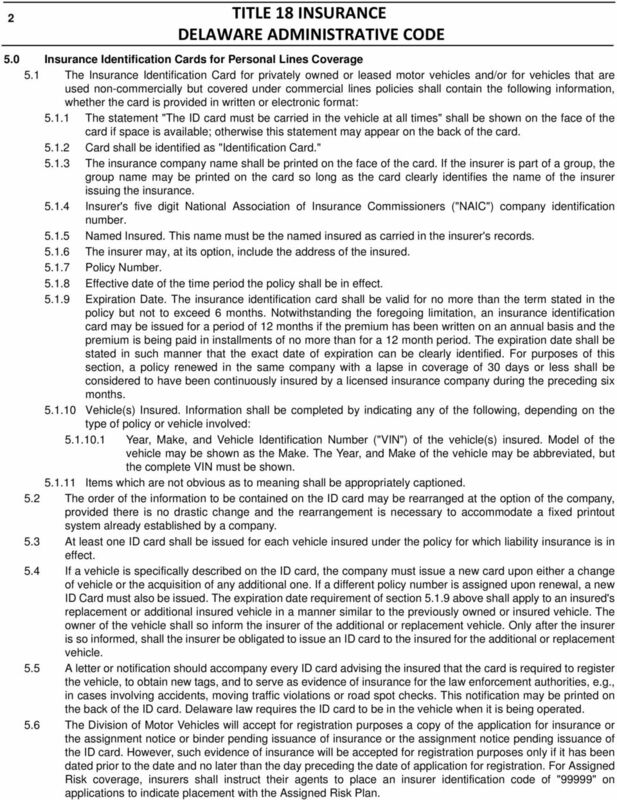 If the insurer is part of a group, the group name may be printed on the card so long as the card clearly identifies the name of the insurer issuing the insurance Insurer's five digit National Association of Insurance Commissioners ("NAIC") company identification number Named Insured. This name must be the named insured as carried in the insurer's records The insurer may, at its option, include the address of the insured Policy Number Effective date of the time period the policy shall be in effect Expiration Date. The insurance identification card shall be valid for no more than the term stated in the policy but not to exceed 6 months. Notwithstanding the foregoing limitation, an insurance identification card may be issued for a period of 12 months if the premium has been written on an annual basis and the premium is being paid in installments of no more than for a 12 month period. The expiration date shall be stated in such manner that the exact date of expiration can be clearly identified. For purposes of this section, a policy renewed in the same company with a lapse in coverage of 30 days or less shall be considered to have been continuously insured by a licensed insurance company during the preceding six months Vehicle(s) Insured. 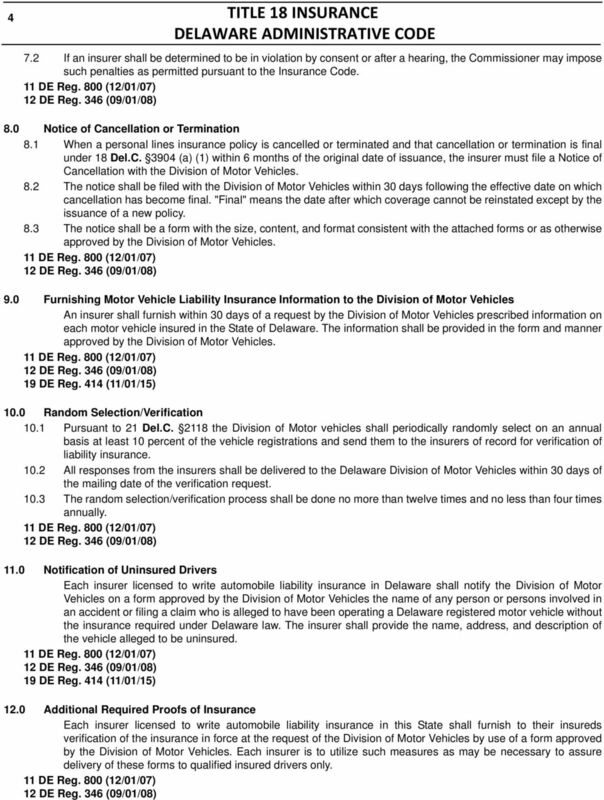 Information shall be completed by indicating any of the following, depending on the type of policy or vehicle involved: Year, Make, and Vehicle Identification Number ("VIN") of the vehicle(s) insured. Model of the vehicle may be shown as the Make. The Year, and Make of the vehicle may be abbreviated, but the complete VIN must be shown Items which are not obvious as to meaning shall be appropriately captioned. 5.2 The order of the information to be contained on the ID card may be rearranged at the option of the company, provided there is no drastic change and the rearrangement is necessary to accommodate a fixed printout system already established by a company. 5.3 At least one ID card shall be issued for each vehicle insured under the policy for which liability insurance is in effect. 5.4 If a vehicle is specifically described on the ID card, the company must issue a new card upon either a change of vehicle or the acquisition of any additional one. If a different policy number is assigned upon renewal, a new ID Card must also be issued. The expiration date requirement of section above shall apply to an insured's replacement or additional insured vehicle in a manner similar to the previously owned or insured vehicle. The owner of the vehicle shall so inform the insurer of the additional or replacement vehicle. Only after the insurer is so informed, shall the insurer be obligated to issue an ID card to the insured for the additional or replacement vehicle. 5.5 A letter or notification should accompany every ID card advising the insured that the card is required to register the vehicle, to obtain new tags, and to serve as evidence of insurance for the law enforcement authorities, e.g., in cases involving accidents, moving traffic violations or road spot checks. This notification may be printed on the back of the ID card. 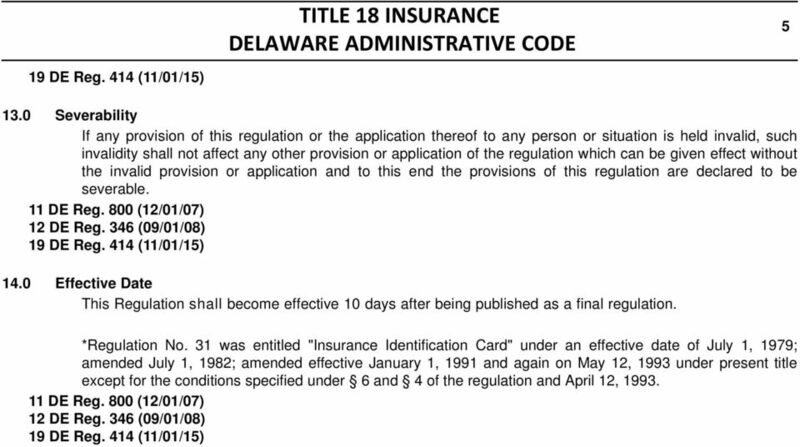 Delaware law requires the ID card to be in the vehicle when it is being operated. 5.6 The Division of Motor Vehicles will accept for registration purposes a copy of the application for insurance or the assignment notice or binder pending issuance of insurance or the assignment notice pending issuance of the ID card. However, such evidence of insurance will be accepted for registration purposes only if it has been dated prior to the date and no later than the day preceding the date of application for registration. For Assigned Risk coverage, insurers shall instruct their agents to place an insurer identification code of "99999" on applications to indicate placement with the Assigned Risk Plan. 3 3 5.7 Insurance ID cards shall be issued in conformance with section 5.1 above. The Insurance Commissioner may exercise his statutory authority to investigate and examine the compliance of insurance carriers with this regulation. The Insurance Commissioner may, after notice and hearing, impose and enter an order as follows: For each occasion where the Insurance Commissioner determines that an ID card was issued inadvertently in non-compliance with section above, the insurer shall be fined $100. No fine, however, shall be imposed if the ID card was validly issued For each occasion where the Insurance Commissioner determines an ID card was issued with disregard of the requirements of Section above, but with no pattern of conscious disregard, the insurer shall be fined $1, For each occasion where the Insurance Commissioner determines an ID card was issued as part of a pattern of conscious disregard of the requirements of section above, the insurer shall be fined $2, "Date of issuance" of an insurance card shall be the effective date of that card. 6.0 Insurance Identification Cards for Commercial Lines Coverage 6.1 Unless otherwise covered in Section 5.0 of this regulation, the ID card for each vehicle insured under each commercial lines policy, which shall include any insurance issued for fleet vehicles, shall contain the following information, whether the card is provided in written or electronic format: the information set forth in sections through 5.1.4, section and section of this regulation; the name of the commercial entity or registrant that owns or leases the fleet as carried in the insurer's records. The insurer, at its option, may include the name of any parent company involved or, in the case of vehicles not operated by the registrant, an indication that the vehicle is "owned or operated by "; the policy number with any appropriate designations required by the insurer for commercial or fleet vehicles; and the effective and expiration dates of the policy. 6.2 The expiration date for ID cards shall be no more than twelve months from the effective date of the policy and the expiration date shall be stated by day, month and year or month, day and year, so long as the exact date of expiration can be clearly identified. 6.3 ID cards subject to the requirements of this section 6 shall also be subject to the requirements set forth in sections 5.2 through 5.6 of this regulation. 6.4 Insurance ID cards shall be issued in conformance with section 6.1 above. The Insurance Commissioner may exercise his statutory authority to investigate and examine the compliance of insurance carriers with this regulation. The Insurance Commissioner may, after notice and hearing, impose and enter an order as follows: For each occasion where the Insurance Commissioner determines that an ID card was issued inadvertently in non-compliance with section 6.2 above, the insurer shall be fined $100. 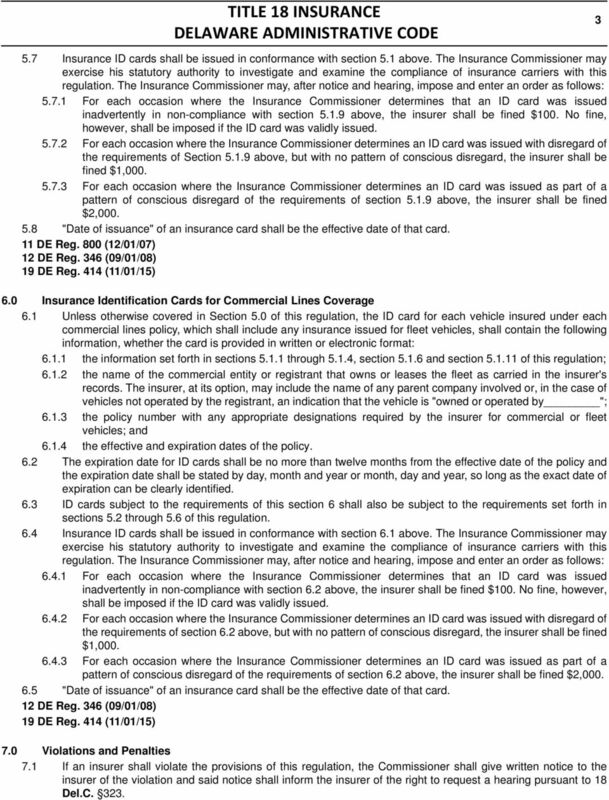 No fine, however, shall be imposed if the ID card was validly issued For each occasion where the Insurance Commissioner determines an ID card was issued with disregard of the requirements of section 6.2 above, but with no pattern of conscious disregard, the insurer shall be fined $1, For each occasion where the Insurance Commissioner determines an ID card was issued as part of a pattern of conscious disregard of the requirements of section 6.2 above, the insurer shall be fined $2, "Date of issuance" of an insurance card shall be the effective date of that card. 7.0 Violations and Penalties 7.1 If an insurer shall violate the provisions of this regulation, the Commissioner shall give written notice to the insurer of the violation and said notice shall inform the insurer of the right to request a hearing pursuant to 18 Del.C. 323. 4 4 TITLE 18 INSURANCE 7.2 If an insurer shall be determined to be in violation by consent or after a hearing, the Commissioner may impose such penalties as permitted pursuant to the Insurance Code. 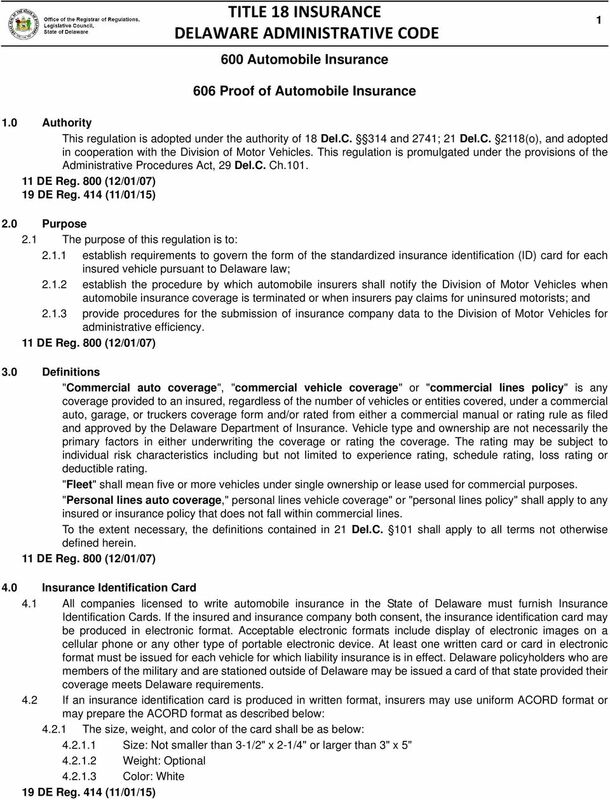 8.0 Notice of Cancellation or Termination 8.1 When a personal lines insurance policy is cancelled or terminated and that cancellation or termination is final under 18 Del.C (a) (1) within 6 months of the original date of issuance, the insurer must file a Notice of Cancellation with the Division of Motor Vehicles. 8.2 The notice shall be filed with the Division of Motor Vehicles within 30 days following the effective date on which cancellation has become final. "Final" means the date after which coverage cannot be reinstated except by the issuance of a new policy. 8.3 The notice shall be a form with the size, content, and format consistent with the attached forms or as otherwise approved by the Division of Motor Vehicles. 9.0 Furnishing Motor Vehicle Liability Insurance Information to the Division of Motor Vehicles An insurer shall furnish within 30 days of a request by the Division of Motor Vehicles prescribed information on each motor vehicle insured in the State of Delaware. The information shall be provided in the form and manner approved by the Division of Motor Vehicles Random Selection/Verification 10.1 Pursuant to 21 Del.C the Division of Motor vehicles shall periodically randomly select on an annual basis at least 10 percent of the vehicle registrations and send them to the insurers of record for verification of liability insurance All responses from the insurers shall be delivered to the Delaware Division of Motor Vehicles within 30 days of the mailing date of the verification request The random selection/verification process shall be done no more than twelve times and no less than four times annually Notification of Uninsured Drivers Each insurer licensed to write automobile liability insurance in Delaware shall notify the Division of Motor Vehicles on a form approved by the Division of Motor Vehicles the name of any person or persons involved in an accident or filing a claim who is alleged to have been operating a Delaware registered motor vehicle without the insurance required under Delaware law. The insurer shall provide the name, address, and description of the vehicle alleged to be uninsured Additional Required Proofs of Insurance Each insurer licensed to write automobile liability insurance in this State shall furnish to their insureds verification of the insurance in force at the request of the Division of Motor Vehicles by use of a form approved by the Division of Motor Vehicles. Each insurer is to utilize such measures as may be necessary to assure delivery of these forms to qualified insured drivers only. 5 Severability If any provision of this regulation or the application thereof to any person or situation is held invalid, such invalidity shall not affect any other provision or application of the regulation which can be given effect without the invalid provision or application and to this end the provisions of this regulation are declared to be severable Effective Date This Regulation shall become effective 10 days after being published as a final regulation. *Regulation No. 31 was entitled "Insurance Identification Card" under an effective date of July 1, 1979; amended July 1, 1982; amended effective January 1, 1991 and again on May 12, 1993 under present title except for the conditions specified under 6 and 4 of the regulation and April 12, 1993. 11 NYCRR 67.0. Text is current through February 15, 2002, and annotations are current through August 1, 2001. 13.12.3.1 ISSUING AGENCY: New Mexico Public Regulation Commission Insurance Division. [7/1/97; 13.12.3.1 NMAC - Rn & A, 13 NMAC 12.3. AUTOMOBILE PHYSICAL DAMAGE INSURANCE INSPECTION PROCEDURES SUBCHAPTER 36. Designated Agent means the party with which the division contracts under Section 42-7-604, C.R.S. Regular Session, HOUSE BILL NO. ACT No. BY REPRESENTATIVE IVEY 0 AN ACT To amend and reenact R.S. :(G)(), (A)() and ()(a) and (b)(i), and (B)()(b),. (C)()(c) and (I)(),, and (A) and (B)(), to enact R.S. Prefiled pursuant to Article III, Section 2(A)(4)(b)(i) of the Constitution of Louisiana. POLICY NUMBER: COMMERCIAL GENERAL LIABILITY CG 04 35 12 07 THIS ENDORSEMENT CHANGES THE POLICY. PLEASE READ IT CAREFULLY. EMPLOYEE BENEFITS LIABILITY COVERAGE THIS ENDORSEMENT PROVIDES CLAIMS-MADE COVERAGE.